Helps reduce the oxidative damage that causes hair to go grey. Contains catalase, a decrease in which contributes to greying of the hair. 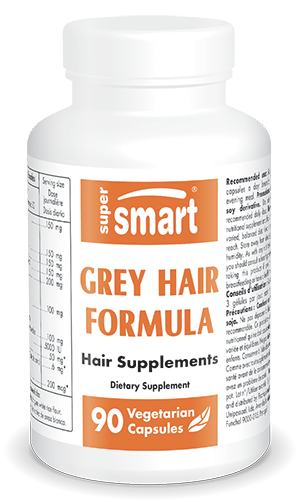 Our dietary supplement Grey Hair Formula is designed to repigment grey hair. It offers a natural alternative to products currently on the market which are often considered to be harmful to health. Indeed, many such options are available for preventing grey hair including substitutes for melanin formation, or the administration of lead salts. In contrast to these products, we offer a natural remedy with our supplement Grey Hair Formula, the composition of which is based on natural-source elements. Our formulation contains the enzyme catalase. Though catalase is naturally present in the body, a decline in its levels is associated with greying of the hair. This molecule has thus been the subject of a number of scientific studies investigating ways of countering the hair-greying process. Catalase prevents the action of hydrogen peroxide, known to play a part in the development of grey hair. In the absence of catalase, hydrogen peroxide interferes with the formation of melanin, the pigment which gives our skin and hair its colour, gradually destroying it. Catalase prevents this destruction by splitting the hydrogen peroxide molecule in two and blocking its activity. This process thus reduces the oxidative damage responsible for greying of the hair. Scientists have found that catalase declines with age, hence the tendency of hair to turn grey or white as we get older. Based on this research, Grey Hair Formula has been specially formulated to include plant-source catalase and thus offers a natural remedy for grey hair. Formulated with natural-source catalase, our dietary supplement Grey Hair Formula also contains an extract of the plant Fallopia multiflora, formerly Polygonum multiflorum. Also known by the name of ho sho woo, or fo-ti, this plant is highly-valued in Chinese medicine for restoring the hair’s natural colour. Though little-known in Europe, it has been used for many centuries in Asia; indeed, certain references claim its use dates back to around 2000 years BC. The plant owes its reputation to having been used by a Chinese emperor called Huangdi, known as the Yellow Emperor. According to ancient sources, ho sho woo, or fo-ti may have been responsible for the Emperor’s eternal youth. Fallopia multiflora has been widely-studied as a result of its potential to combat the effects of ageing. Such research has expanded scientific knowledge of some of the benefits of this traditional Chinese plant. In particular, it may help reduce deposits of lipofuscin, the pigment responsible for liver spots. Studies are still ongoing, but it also appears to have blood pressure-lowering and immune-modulating effects, essential for the body’s defences. metal catalysers such as zinc and copper. Delivered in capsule form, these ingredients combine to provide a comprehensive dietary supplement for countering the hair-greying process. For optimal results, it is advisable to take a dose of three capsules a day, for a minimum of three months. Other ingredients : Micrcocrystalline cellulose, magnesium stearate, silicon dioxide.